One of Zagreb’s charms is that it has a real forest in its very centre – forest Tuškanac. The best way to explore this beautiful green oasis is to take a walk on the trail called Dubravkin put, which starts not so far from the bustling Ilica. The trail was created in the second half of the 19th century and its original name was “Sofia’s path”. Later it was renamed into “Dubravka’s path”, after a famous character from Croatian literature. There are a couple of cult places on the way from Ilica to the start of the path, like Velvet cafe (check the article), arthouse cinema Tuškanac, the once popular, now closed club Saloon, and a fancy restaurant Dubravkin put. But once you pass these relatively populated places, the atmosphere becomes quieter, and you can enjoy an easy, two-kilometre-long walk to Cmrok meadow. My favourite place on this route is definitely the summer cinema Tuškanac, located near the start of the trail. It was built in 1954 in the shape of an amphitheatre, and was very popular till it closed in 1970, when it fell into oblivion and decay. It was renovated just recently, in 2012, to host summer film festivals. 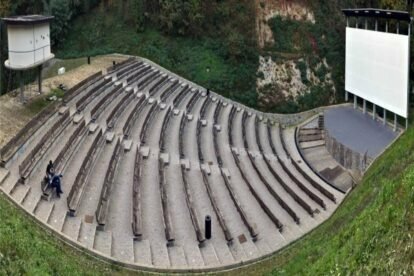 On hot summer evenings, this beautiful amphitheatre surrounded by forest offers good films and lower temperatures. After the cinema, the most tranquil part of Dubravkin put starts – you might see a few locals walking their dogs, running or just promenading, but it might easily be that you have the trail just for yourself.